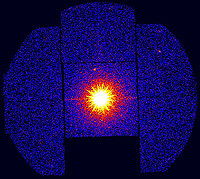 ESA's gamma-ray observatory, Integral, has spotted a rare kind of gamma-ray outburst. The vast explosion of energy allowed astronomers to pinpoint a possible black hole in our Galaxy. "The galactic centre is one of the most exciting regions for gamma ray astronomy because there are so many potential gamma-ray sources," says Roland Walter, an astronomer at the ISDC, and lead author of these results. It was during one of the first of these observations that astronomers saw the outburst take place. An unexpected event of this kind is known as a 'target of opportunity'. At first they did not know what kind of eruption they had detected. Some gamma ray outbursts last for only a short period of time and so they immediately alerted other observatories around the world of the outburst’s position, allowing them to target the explosion, too. Fortunately, Integral has the capability to pinpoint the position of such a very bright event incredibly accurately. In this case, the outburst continued to rise in brightness for a few days before beginning a gradual decline that lasted for weeks. The way the brightness of an outburst rises and falls is known to astronomers as a light curve. "It was only after a week that we could see the shape of the light curve and realised what a rare event we had observed," says Walter. Comparing the shape of the light curve to others on file revealed that this was an eruption thought to come from a binary star system in which one component is a star like our Sun whereas the other is a black hole. In these systems, the gravity of the black hole is ripping the Sun-like star to pieces. As the doomed star orbits the black hole, it lays down its gas in a disc, know as an accretion disc, surrounding the black hole. Occasionally, this accretion disc becomes unstable and collapses onto the black hole, causing the kind of outburst that Integral witnessed. Astronomers are still not sure why the accretion disc should collapse like this but one thing is certain: when it does collapse, it releases thousands of times the energy than at other times. Because such active star–black hole binaries are thought to be rare in the Galaxy, astronomers expect Integral to see such an outbursts only once every few years. That makes each and every one a precious resource for astronomers to study. Thanks to the quick reactions of the astronomers at ISDC, observations were taken with satellites and observatories all around the world. ESA's XMM-Newton X-ray observatory, NASA's Chandra and Swift space telescopes, numerous ground-based telescopes captured the elusive radiation from this cataclysmic event. Now astronomers are hard at work, understanding what it all means. 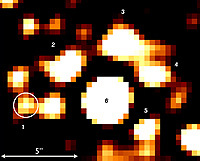 Notes for editors The results, described in the article "IGR J17497-2821: A new X-ray Nova", by Roland Walter et al., will appear in Astronomy and Astrophysics. An on-line version with images can be found at http://isdc.unige.ch/Science/news/061123/.